In mid-March we're bringing in Mark Hummel's Blues Harp Blowout featuring Charlie Musselwhite and Kim Wilson. Visit www.ncfta.org for more info. By the way, if you've been to the Narrows over the past week or so you may have heard the CD over the speaker system. Will Lucy Kaplansky Be Bringing Her New CD? Lucy Kaplansky is coming to the Narrows this Friday for her second big visit. Her new album, called "Over the Hills," won't be released until March 13. Will she be bringing copies to the concert this Friday, several weeks before the official release? At this point, we're not sure if it's ready for sale, but we have had artists sell CDs at concerts before their official release, so it's possible. Cassandre McKinley jazzed up the Narrows Friday night with a swingin' three piece band and right-on-the-mark vocals. She particularly focused on her latest CD in which she covers Marvin Gaye tunes--but she did a great version of the Beatles' "Yesterday" that these furry ears thought sounded like a hit. 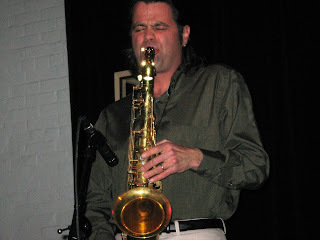 This was a jazz show, something we rarely do at the Narrows, in part because we don't get the audience. Cassandre had a healthy draw, particularly considering the fact that she's new to the scene, but she deserved a full house. Is jazz dead? Artistically it's not. But do people really want to come to the Narrows and listen to jazz? We hope so, because as a center for the arts we're interested in bringing the finest talent doing a range of music. We wouldn't mind doing a classical show, either, by the way. How about we take a poll. Please leave a comment about whether you would consider coming to a jazz show at the Narrows, and, if so, what artists you'd come to see. He didn't even get a star billing--but playing keyboards for jazz diva Cassandra McKinley at the Narrows Friday night was a guy who tours with the Boston Pops Orchestra and received an Emmy last year for a song used in the "Young and the Restless." And that's just the beginning for this keyboard cat. His name is Brad Hatfield. Visit his website to learn more. You never know who you'll bump into at the Narrows. Wow--this one snuck by us. The New Riders of the Purple Sage coming in July. Check out the schedule at www.ncfta.org. The first official Narrows' discovery to go bigtime, Sarah Borges, has her new record coming out in June. It will be on Sugarhill Records, a well-known national label. The name of the new CD: Diamonds in the Dark. By the way, we'll soon be announcing a June show with Sarah and her band. Hope you'll be there! Sort of strange photo to put on a music blog, but humor your humble blogger on this one. 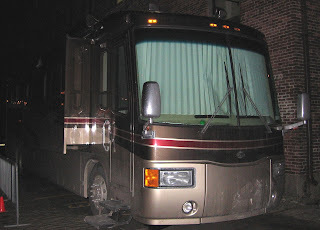 Blues woman Rory Block and her husband Rob bring the comforts of home with them when they hit the road, as you can see by the pictured vehicle parked outside the Narrows Saturday night. The side of the bus springs out for extra room. Very groovy. 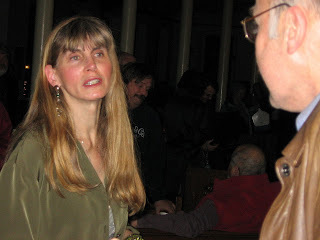 Rory was "teachin' the blues" during this visit--talking about how to find strange tunings on the guitar, and the brilliance of Robert Johnson and how she got to know his family. Did Robert Johnson sell his soul to the Devil at the crossroads so he could play the guitar better? Rory didn't think so, even suggesting that Johnson was a "godly" man. Take a look at the lyrics to "Crossroads": "I went to the crossroads, fell down on my knees....I asked the Lord above, have mercy, save poor Bob if you please." No question: Rory Block takes her music damn seriously, and also deeply appreciates the opportunities she has had in her life to meet Robert Johnson's son and grandson, and to meet the likes of Son House, Rev. Gary Davis, Skip James and Mississippi John Hurt. But she also enjoys meeting her fans, which she did after her show. Rory is a "godly" woman. 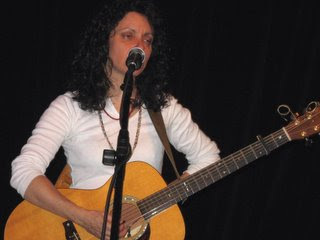 Don't miss our annual visit from blues woman extraordinaire Rory Block this Saturday night. That's her in the photo at the Narrows last February. Don't know her? Well, doggone it you've got to click right here. Bill Harley, whom your humble blogger has done a project or two with, won a Grammy yesterday. Bill is a children's performer, who, if memory serves, was a prime mover for Stone Soup in Providence. He lives in Seekonk. I spotted Bill at the Narrows last year sometime and we had a nice chat. Congrats good guy Bill Harley! Rick over at the Projo did a piece, which you can read here. The other local guy up for a Grammy, Duke Robillard (coming to the Narrows in March), did not win. If you were watching Jay Leno last Friday (2/9/07) you might have spotted Narrows' alum Jim Lauderdale backing Solomon Burke on guitar. Solomon Burke did Jim's song "Seems Like You're Gonna Take Me Back." 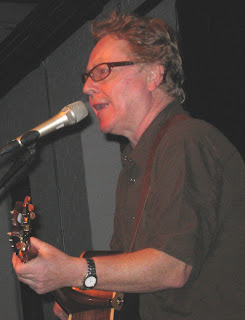 Irish singer/songwriter Paul Brady worked the guitar and piano, as well as an enthusiastic crowd that called him back for two encores (very rare), at the Narrows Saturday night. It was his debut performance at our esteemed listening venue. Duke Robillard, whose next area show is at the Narrows in March, is out in LA for the Grammy's tonight. He's up for one. Rick over at the Projo wrote a nice piece in today's paper. Check it out here, and good luck Duke! 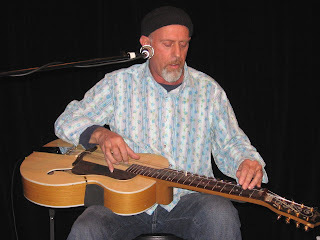 Canadian Harry Manx brought his guitar wizardry to the Narrows Friday night. Or perhaps it was stringed wizardry, since his banjo sounded like--well, we're not quite sure, but it worked well when he played Jimi Hendrix's "Voodoo Chile," which blended into B.B. King's "The Thrill is Gone." 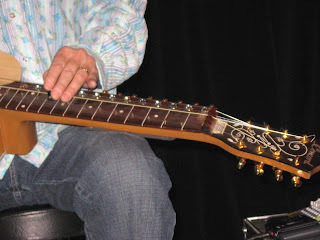 One of his guitars (see farther down) was strung like a sitar and sure enough it sounded like a sitar. It has something like 20 strings and, he said, "it takes four hours to tune." Congrats to Patrick and Deb and everyone who has been working on the new website. As I write this, it is up and running. In case you came to this blog through other means, the website I'm talking about is www.ncfta.org. These haven't been posted yet on the official schedule at www.ncfta.org but will be soon. 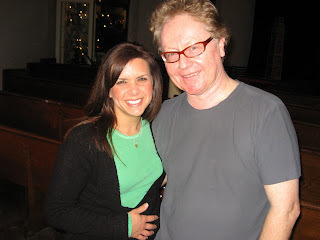 Kris Delmhorst--Great songwriter, singer. She's got a following across the country, particularly in the Boston area. 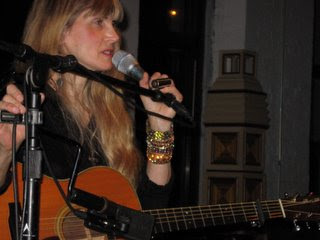 She's still building an audience in the Fall River/Providence area, so you might not know her, even though she's played the Narrows several times as well as one of our outdoor events. That's her in the photo, by the way. Aztec Two Step--These guys are a solid draw. We had them play the Narrows for the first time about a year ago. Drew a large crowd and they put on a heck of a show. They've been working musical venues in this area for decades. Might be a sell out, so don't wait too long for this one. Richard Shindell--Wow, we're talking September already. This will be his second visit. He's a national, perhaps international, legend to those following the serious singer/songwriter types. She's not the first former member of the Grateful Dead to play the Narrows, but she probably has had a higher profile than the late Vince Welnick. 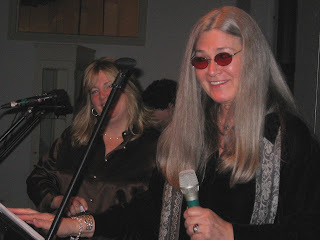 Donna Jean Godchaux brought her new crew, Kettle Joe's Psychedelic Swamp Revue, to the Narrows Friday night. Although your humble blogger is far from being a rabid Grateful Dead fan or expert, there certainly was a Dead vibe, with extended guitar solos, layered vocals where there really wasn't a lead singer, and a general friendly groove. Click her name to learn about Donna Jean. 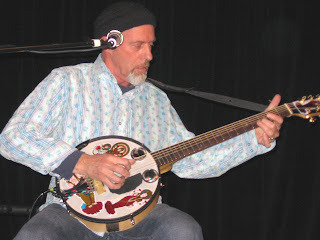 Pedal steel guitar god Sneaky Pete died in early January; and your humble blogger missed the notice! In case you did, I've dug up some info about his death and his career. In short, Sneaky Pete was in the Flying Burrito Brothers with Americana saint Gram Parsons and underappreciated Narrows vet Chris Hillman, and did session work for John Lennon, Joe Cocker and many others. Grabbed this from the Mercury News. Click right here. See the Flying Burrito Brothers on youtube, featuring some fuzzy, psychedelic pedal steel from Sneaky Pete, by clicking here. Roots label Sugar Hill Records has signed Narrows "discovery" Sarah Borges. "We're very excited to have Sarah on Sugar Hill," says Kevin Welk, president of the Welk Music Group. "We are eager to expand on her already enthusiastic base and bring her music to a larger audience." "I'm so happy to become a part of the Sugar Hill roster," says Borges. "The band and I are excited to be introduced to folks who are already fans of Sugar Hill artists, and we're looking forward to bringing our brand of rock'n'roll to the label's vast catalog of exceptional music." Artists on Sugar Hill include Nickel Creek, the Duhks, James McMurtry, Dolly Parton and Tim O'Brien. "I know I can speak for everyone at the Narrows in congratulating Sarah and her band on this accomplishment," said Narrows' emcee and blogger Steve Hug. "When Narrows president Patrick Norton first brought her to the Narrows a couple years back as an opening act, we didn't know what to expect. We were blown away from the start!" Sugar Hill will release her label debut this year. Borges will go back into the studio with Paul Q. Kolderie, the Boston-based producer of her acclaimed 2005 album, Silver City (Blue Corn). 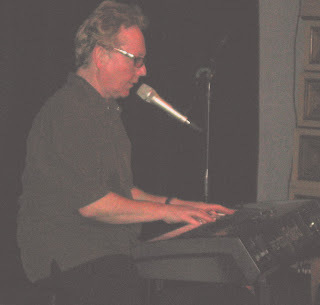 Kolderie has more than 300 records under his belt as producer and engineer, including acts like Hole, Radiohead, Morphine, and scores of others. Borges says the new record will be "a take-home version of our live show - full of energy and heartfelt songs, with a nod to the music that's come before us and an eye on our indie rock heritage." Sugar Hill Records is owned by the Santa Monica-based Welk Music Group, who also owns the prestigious and historical Vanguard Records.